California may be the heavyweight champion of propelling prominent American bands and artists into popular music history (Creedence Clearwater Revival, The Eagles, Linda Ronstadt, Santana, Jefferson Airplane, Little Feat, Red Hot Chili Peppers, Fishbone, N.W.A., Joni Mitchell, The Doors, the Grateful Dead, Tower of Power, Rage Against the Machine, War, Stone Temple Pilots, Los Lobos, Cypress Hill, Van Halen, Primus, Weezer, Jane’s Addiction, and Frank Zappa, to scratch the surface), but Georgia may be the leading contender despite being decidedly smaller geographically. Consider that the underrated Peach State has likewise spawned or nurtured the careers of acts as diverse as the Allman Brothers Band, James Brown, Ray Charles, Dixie Dregs, Aquarium Rescue Unit, the Black Crowes, Goodie Mob, the B-52s, Mother’s Finest, Outkast, R.E.M., and Widespread Panic, the 31-year-old jam band that took the main Ford Stage at SunFest on the afternoon of the event’s final day, May 7. It’s the same stage where a comparatively fledgling Widespread Panic, in 1994, delivered the kind of ho-hum, middling, unfocused performance that stereotypes jam bands — which are regarded in some circles as being composed of musicians who can improvise, yet aren’t advanced enough to do it at speed over the chord changes of jazz, the genre that truly demands the ability to do so. The sextet’s SunFest performance this time around was decidedly different, for a couple reasons. One is the band’s natural maturity, both as composers and musicians, over the 23 years since. 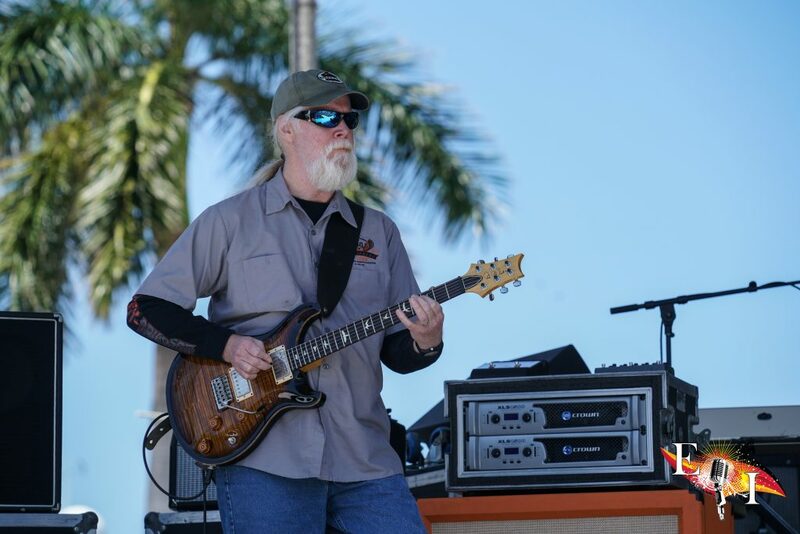 But the primary difference proved to be guitarist Jimmy Herring, whose tenure in the band spans only around the past decade. As evidenced by his two stellar solo releases since 2008; current co-headliner status touring with John McLaughlin, and mid-1990s tenure in the Grateful Dead fusion cover act Jazz is Dead, plus the Aquarium Rescue Unit — the impossible-to-categorize group of virtuosos led by Col. Bruce Hampton (the singer/guitarist who tragically died after collapsing onstage at his own 70th birthday tribute concert at the Fox Theater in Atlanta on May 1), the graduate of the Guitar Institute of Technology in California can improvise in any style, jazz included. Herring’s musicality and soloing elevated both the SunFest crowd and his Widespread Panic band mates John Bell (vocals/guitar), John “Jojo” Hermann (keyboards/vocals), Dave Schools (bass/vocals), Domingo “Sunny” Ortiz (percussion) and Duane Trucks (drums), the 28-year-old younger brother of heralded guitarist Derek Trucks who replaced retired original drummer Todd Nance last year. “Good morning, SunFest people!” Bell said as the band strode onstage at 2:10 p.m. It would be the only words uttered by any of the band members over the next 110 minutes. Schools’ bass and Trucks’ kick drum were too boomy during introductary numbers “Send Your Mind” (the title track from the band’s self-titled 1991 sophomore album) and “Henry Parsons Died” (Everyday, 1993). Once those sound problems were dealt with, though, the Georgia sextet started to build in intensity as an already-impressive crowd continued to grow. “Space Wrangler,” the title cut from the group’s 1988 debut, proved worthy of its title. 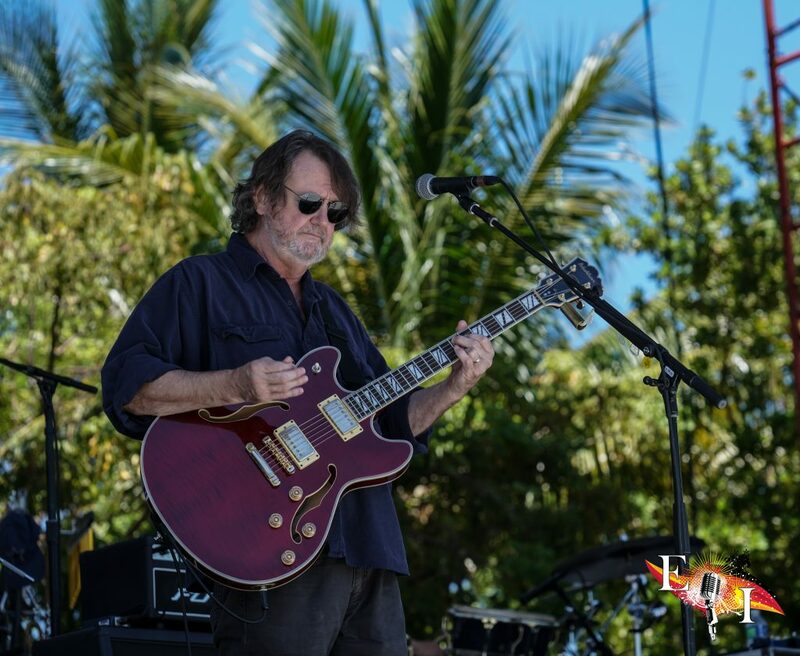 Widespread Panic may specialize in mid-tempo feels, but the band has learned how to shift within them — and to let Herring unleash torrents of notes during his solos within the ample space between beats. The piece’s feel ranged from bluesy to funky, with Hermann’s clavinet leading that segue. A subsequent shuffle cadence upshifted for the guitarist’s break, his first of several such memorable statements, before the band downshifted to a coda. A four-song medley then took up most of the next hour. “Second Skin,” from the 2006 release Earth To America, blended elements of the Allman Brothers, Little Feat and the Grateful Dead through the rhythm section’s swaying patterns, the solos of Herring and Hermann, and the lead guitarist’s harmonies with Bell, who played slide guitar. Schools’ bass solo led to “Rebirtha” (from Light Fuse Get Away, 1998), featuring Herring and Bell effectively soloing simultaneously. A breakdown by Trucks and Ortiz then led into “Tall Boy” (Bombs & Butterflies, 1997), another funky vehicle with a banner solo by Herring (until he broke a string), Hermann filling in during the interim with his own effective break on Hammond organ, and yet another soaring vocal by Bell, whose voice can range from raspy tenor to alto and falsetto. The medley concluded with “Shut Up and Drive” (Dirty Side Down, 2010), with its bluesy chord progression, Trucks’ marching snare drum, and Herring’s singing guitar solo. A subsequent medley serpentined even further. “Papa’s Home” (from Everyday) started the proceedings with a slow, 6/8-timed blues tempo, which morphed into a New Orleans second-line feel to accommodate Hermann’s piano solo. The spotlight was then put on Ortiz, who soloed on timbales and then played congas and bongos with his right hand while crashing cymbals with a drumstick in his left. Schools’ break found the bassist making ample use of the range of his six-stringed instrument, and Trucks’ unaccompanied solo led into “Bust It Big” (Night of Joy, 2004), a Dead-like rocker that was Hermann’s lone lead vocal of the concert. Bell then took the mic to deliver the gorgeous ballad “Expiration Day” in a lower vocal register (a la Lowell George on Little Feat’s epic “Willin’”), also highlighted by Herring’s supreme soloing and melodic accompaniment. After such comparatively lighter fare, Widespread Panic ended the show on its heaviest note, and with a twist. The rocking medley of “Protein Drink/Sewing Machine” opened with Herring and Schools harmonizing instrumentally with one another before the piece displayed Herring’s Middle Eastern influence via a complex web of notes between he, Schools, Hermann and Bell. The singer took an unaccompanied middle vocal break before the band returned in full-boil mode through Hermann’s Hammond solo and Herring’s final fuselage. The fiery finale and preceding ballad displayed the light-and-shade range of a band that has clearly reached the peak of its powers. What a difference a quarter-century, and a six-stringed musical lightning rod, can make.